Hi everyone! 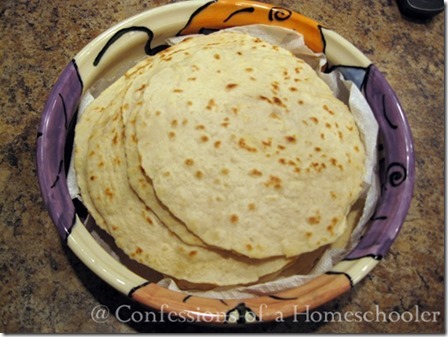 I wanted to share a yummy recipe with you today, they’re my homemade tortillas. 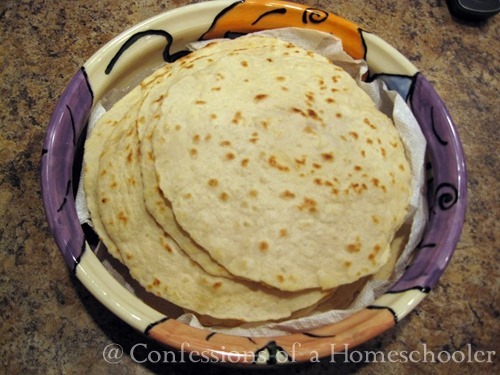 I actually have 2 recipes to share, one is for white flour tortillas, and the other is for whole wheat tor tortillas. Either way my kids devour these! They eat them as snacks all by themselves, with peanut butter and jelly, cheese, or with salsa. Not only are they better for you than store bought tortillas, but they’re less expensive and sooooooo good! Optional: I highly recommend a Tortilla Maker for this. Rolling them out by hand is difficult and the tortillas don’t get as thin and flat. Or at least I can’t get them thin enough! Instead I use the Villaware Tortilla Maker, and it’s amazing! In medium sized bowl, mix dry ingredients together. Next cut in shortening until well blended into flour mixture. Slowly add water mixing well with your hands until you work it into a sticky dough. Turn dough out onto a floured surface and knead vigorously for about 2 minutes, or until the dough is no longer sticky. Return the dough into your bowl and cover with a damp cloth and allow it to rest for about 10-20 minutes. This will make it easier to roll. 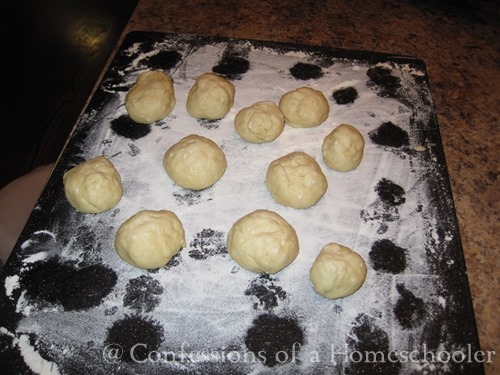 Shape dough into egg size balls and place them on a floured board so they do not touch. Cover with wax paper or a kitchen towel so they don’t dry out while you’re baking them. Pre-heat a skillet or griddle to a medium heat. Dust a clean surface with flour and one at a time press the dough balls into a 5” circle. Using a floured rolling pin carefully roll tortillas into a nice round shape about 1/8” thick or as thin as you can get them, and about a 7” circle. Carefully transfer the tortilla one at a time to a dry pre-heated skillet. Flip with kitchen tongs and cook the other side. I cook them just about a 30 seconds to 1 minute on each side or until your tortillas start bubbling up a bit and lightly browning. Remove the tortilla and place it on a clean paper towel and loosely cover with foil. Repeat process for the remaining dough balls. Tortillas freeze well too! Wrap tightly in plastic, removing any air pockets. Then place them into a gallon freezer bag and freeze for several weeks. To serve, thaw at room temperature, then wrap in foil and heat in a warm oven. If you use the Villaware Tortilla Maker, simply place the dough ball into the center of your tortilla maker, then carefully press down the top lid until it is flat. Wait for a few seconds, then open the tortilla maker to make sure it’s flattened out well. Continue cooking the tortilla for about 30 seconds, then flip with kitchen tongs and cook the other side. The tortilla will be golden, but not over cooked. And despite young Strawberry Shortcake, you do NOT want to touch this with your fingers, hot! Directions: Mix together dry I ingredients, then add vegetable oil and water, mixing by hand. Knead dough about 2 minutes, then place in a covered bowl for about 30 minutes. Roll dough into golf ball sized balls, then continue with steps as shown above in the flour tortilla directions. And that’s it! Tortillas are actually super easy to make and the homemade taste is well worth the effort! I’ve never had any luck rolling tortillas myself but that tortilla maker looks like it would work really well. I need to put that on my wish list! Lard is making a comeback or at least I see people using it in recipes because it is a natural monosaturated fat. Crisco is what you want to avoid because of the hydrogenated oils and its totally synthetic nature. 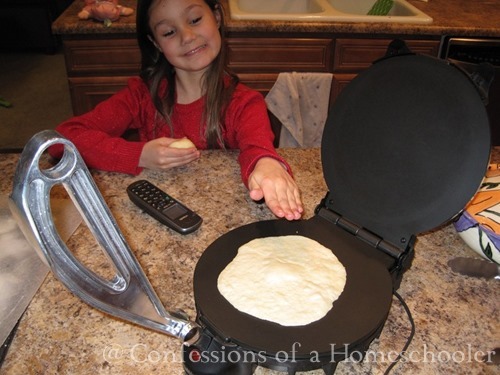 oh, I thought these were fried or baked, did not know there was a tortilla press! I’ve made those a couple of times. It was a lot of work and a lot of mess to clean up! The ones I made did not have lard in them…I think it was just crisco, and they did have a little baking powder which makes them fluffier! Hi, these look great! Question, do you know how they would turn out if I used refined (so they don’t taste like Coconut) Coconut Oil instead of lard? Yum, we had tortillas last night, we usually have all our fillings ready and as they cook I fill them, wrap them and roll them up in tinfoil then place in oven to keep warm until they are all done:) We fill them with salad ingredients and sometimes rice, or stir fry mix, or even meat curries like butter chicken etc, so tasty. We use to make tortillas in girl scouts. We would make them for our campouts and we would roll them by hand with a plastic cup. Beings back the memories. These ar eon my list to do this summer. My in-laws have a tortillas press we will borrow. Thanks for sharing this recipe! 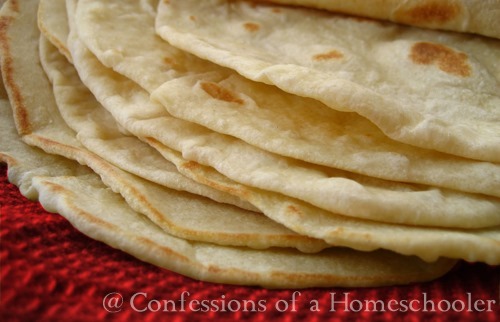 We eat tortillas a lot, but I buy them, I’ve tried making them homemade before and they don’t turn out as good as the store bough, I will have to try a tortilla maker, thanks for the tip! I made tortillas tonite and they were delicious! My seven year old son who is also autistic rolled out the tortillas as I was cooking them and he did better than me!